NEC has introduced the MultiSync PA242W, a new 24-inch, GB-R LED backlit display with "a wider color gamut and more color control than a conventional white LED backlight." With 1920x1200 resolution and 10-bit wide color gamut, the MultiSync PA242W features 99.3 percent coverage of Adobe RGB and the ability to load ICC profiles. Available now, the monitor comes in two versions: the $1,049 PA242W-BK model and the $1,299 PA242W-BK-SV model that includes NEC's SpectraViewII calibration software and sensor. CHICAGO -- NEC Display Solutions of America, a leading provider of commercial LCD and projector solutions, has announced the 24-inch MultiSync PA242W-BK color accurate display and color critical PA242W-BK-SV display solution with SpectraViewII calibration software and sensor. "The simple print matching and built-in KVM feature improve their overall productivity as well." The PA242W display is built on a GB-R LED backlight, which provides a wider color gamut and more color control than a conventional white LED backlight. 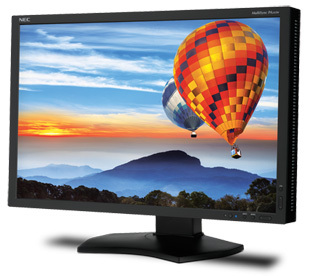 Suitable for applications where accurate color is necessary such as photography, retouching, video editing and pre-press, the MultiSync PA242W monitor offers a robust design with a fully ergonomic stand for added comfort during use. It also features a 1920x1200 resolution and 10-bit wide color gamut LCD panel that provides the accurate, vibrant colors that professionals require. In addition, the MultiSync PA242W showcases the time-saving features common to the MultiSync PA Series displays, including the ability to load ICC profiles to emulate custom color spaces and easily match image prints, as well as offering factory-calibrated digital uniformity correction and five customizable Picture Mode presets. "The PA242W's greater color gamut and color control provide trusted color reproduction, empowering photographers and other graphics users to focus on their work," said Art Marshall, Product Manager of professional and medical desktop monitors at NEC Display Solutions. "The simple print matching and built-in KVM feature improve their overall productivity as well." The free MultiProfiler software, exclusive to the MultiSync P & PA Series, provides easy-to-use control over most display settings, including print matching with Picture Mode presets as well as Picture in Picture and Picture by Picture window configuration. MultiProfiler also allows users to manage the monitor's USB hub and enables keyboard shortcuts for changing inputs and Picture Modes. The ICC profile support in MultiProfiler offers MultiSync PA242W users an easy way to match prints. The MultiSync PA242W-BK and PA242W-BK-SV ship with a four-year limited parts and labor warranty and are now available at an estimated street price of $1,049 and $1,299, respectively.